© 1979 Sidney Harris. Reprinted with permission from Sidney Harris. All rights reserved. 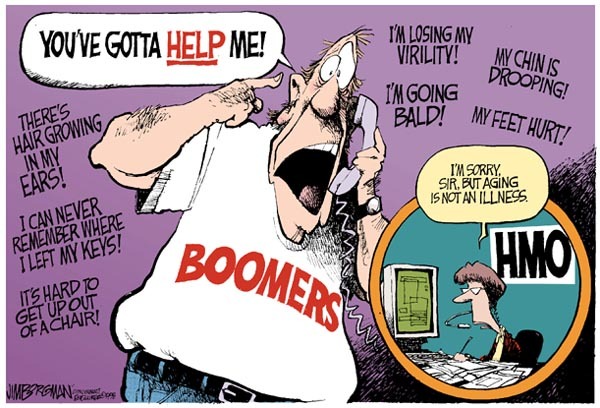 Overwhelmed by health infomation? Not sure what to believe when you see health headlines like these? You're not alone. Advances in science and technology continue to increase the amount of health information available to the media and public. This guide seeks to help consumers evaluate health and scientific information and consider how the information can be used to improve their lives in the Age of Risk Management. Check out this online Consumer's Guide to Health Information or print it (PDF). 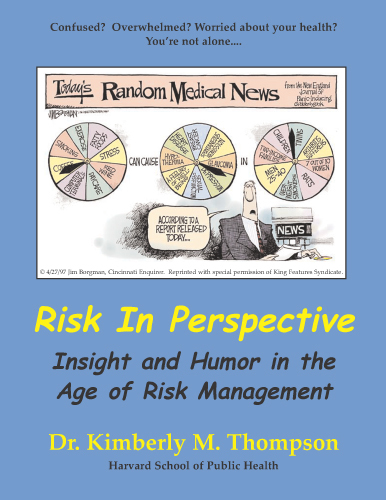 If you enjoy this guide, then get more insight and humor from Dr. Thompson's book Risk in Perspective: Insight and Humor in the Age of Risk Management. Most people are on their own as they evaluate health information, put it into context, and make important health care decisions for themselves and their families. This requires an understanding of the concept of risk. Risk is important because it implies that there is some chance that something bad might happen. The uncertainty can be frustrating and frightening, but it also means that your attitude and choices can play a major role in your future health. The best advice you might get when it comes to making sense of health information is ASK QUESTIONS! Check out a list of 10 questions designed to help you turn health information into clues and to get you started on becoming your own health risk detective. © 4/27/97 Jim Borgman, Cincinnati Enquirer. Reprinted with special permission of King Features Syndicate. Get past the presentation to the facts. 2. Is the source reliable? Think about the quality of the information. Information comes from many sources, good and bad. 3. How strong is the evidence overall? Understand how this information fits in with other evidence. 4. Does this information matter? Determine whether the information changes your thinking and leads you to respond. 5. What do the numbers mean? Remember that understanding the importance of a risk requires that you understand the numbers. 6. How does this risk compare to others? Put the risk into context. 7. What actions can be taken to reduce risk? Identify the actions you can take to improve your health. 8. What are the trade-offs? Make sure you can live with the trade-offs associated with different actions. Focus on identifying the information that would help you make a better decision. Find the information you need to make a better decision. Sources personalize information to make it more interesting, but not everyone relates to the same things. Your perception of information can depend on whether it is presented as positive (half-full) or negative (half-empty). Flipping the statements and looking for alternative ways to state them might change your perception. For example, if you hear about a small number of people being affected, remember that this means a large number are not affected, and vice versa. When the facts seem confusing, keep in mind that you might have been given false or incomplete information or you may have misunderstood the information given. © 5/20/98, Jim Borgman, Cincinnati Enquirer. Reprinted with special permission of King Features Syndicate. All sources have a motivation for providing information. Try to identify the source and its funding so that you can consider any possible biases. The fact that a source or its source of money may benefit from the information does not necessarily mean that the information is false. It is important to read between the lines. Look for the assumptions that make the observations relevant to other members of the population. For example, do you have to assume that the same effects occur in humans as in rats? in women as in men? in children as in adults? These types of assumptions raise questions about how well the conclusions from the sample apply to the larger population. They do not necessarily mean that the conclusions are wrong or that more studies are needed. Understand how this information fits in with other evidence. Some sources generally strive to provide unbiased coverage, while others may be intentionally biased. Consider how many sides of the story you hear and whether your source tells you about all of the possibilities, and the weight of the evidence. Remember that extensive coverage of a story can be misleading if it does not reflect the amount of evidence that supports the claim. In particular, the results of early studies can turn out to be right or wrong after time. Americans have mistakenly rejected results that later proved true, and accepted results that later proved false. Determine whether the information changes your thinking and leads you to respond. Just because information appears in the media does not mean that it affects you or someone you care about. Some newsworthy risks (like accidents and homicide) may be overreported in the news media, while other, less newsworthy risks (like heart disease and stroke) may be underreported. The result is that you might be led to worry about small risks that appear to be big and to ignore big risks that appear to be small. Remember that understanding the importance of a risk requires that you understand the numbers. Information about health risks gives the chances of an outcome occurring. To avoid confusion, put the numbers into a format that you can understand. Remember that you can also write 1 in 100 as 1%, ten thousand out of a million, 0.01, 1x10-2, one penny out of a dollar, or 10 in 1,000. Researchers report their findings as expected values within a range. The breadth of the range shows how confident they are about the results. When only one number is reported, it is probably pulled out of a range and it does not inform you about the researcher's confidence in the result. In such cases, it is important to understand whether the number reflects the worst case, the best case, or something in the middle. Remember that risks change with time, and that some people have higher or lower risk numbers than other people. Think about any habits or behaviors you have that put you at a higher or lower risk for a particular outcome. 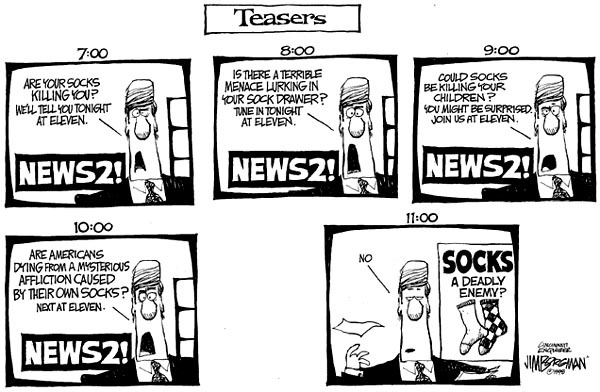 © 7/19/98 Jim Borgman, Cincinnati Enquirer. Reprinted with special permission of King Features Syndicate. 6. How does this risk compare to others? Since numbers about risk can be presented in many forms (like the chances of dying from a cause over a lifetime, during a year, or during an event), make sure you compare similar forms. Consider that reporting different parts of a range for different risks (best case for one vs. worst case for another) can be very misleading. These factors might mislead you sometimes. For example, an unfamiliar chemical like dihydrogen monoxide might sound threatening, even though it is simply another name for water. Remember that science can not answer the question "Is it safe?" for anyone. You must decide what is an acceptable risk and make health decisions based on your personal judgment. Identify the ways that you can improve your health. Be creative. Think about actions that can reduce your risk. For risks that are new to you, take the time to think about them before forming an opinion. Keep in mind that just because someone you know picks one action does not mean that the same action will be right for you. Make sure you can live with the trade-offs associated with different actions. Every decision involves trade-offs. When talking about medications, trade-offs are often called side effects, like when the medicine you take to get rid of your headache upsets your stomach. Ignoring potential trade-offs when considering an action to reduce or eliminate a risk might ultimately put you (or someone else) at greater risk. Taking action can also lead to trade-offs of other important resources, particularly time and money. Some people object to the idea that they might be asked to trade between health and money or other factors. Most people make these choices automatically, however, by driving slower at the cost of a few extra minutes or spending money to buy a bicycle helmet for their child or a smoke detector for their home. Remember that resources spent to reduce one type of risk are not available for other activities. Focus on identifying the information that would help you make a better decision. Remember that scientific information is always somewhat uncertain even if it is not reported that way. Think about what information is missing and how you would use more information if you had it. 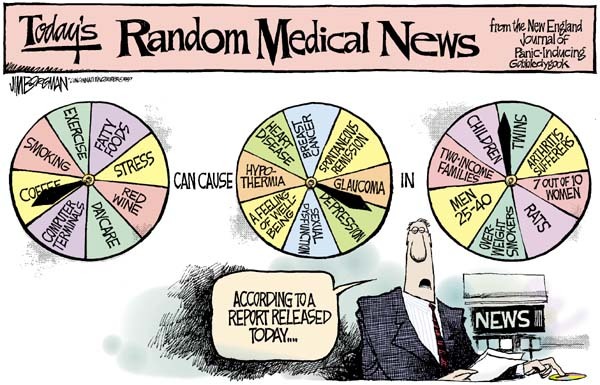 Keep in mind that if you rely on the headlines as a basis for managing your health, you are likely to overlook the well-established (and consequently not newsworthy) strategies for improving your health. 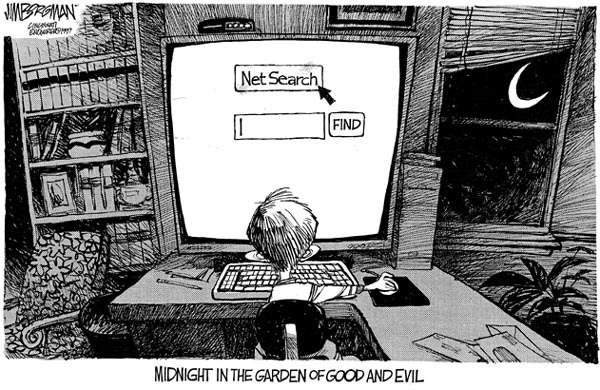 © 12/4/97 Jim Borgman, Cincinnati Enquirer. Reprinted with special permission of King Features Syndicate. · Get a copy of Risk In Perspective: Insight and Humor in the Age of Risk Management! For more information about this completed project, please e-mail Dr. Thompson. © 1999, 2004 Kimberly M. Thompson. This guide provides an excerpt from the book Risk In Perspective: Insight and Humor in the Age of Risk Management by Dr. Kimberly M. Thompson, which is also available from www.AORM.com or Amazon.com. Development of this guide was funded in part through an educational grant to the Harvard School of Public Health from the Chlorine Chemistry Council.